Apologies: ZL2US, ZL2DC, ZL2LF, Ms Helen Roughan. Present: Lee ZL2AL, Dave ZL2DW, Mike ZL2MY, Willy ZL2AGD, Wally ZL2MO, Bert ZL2OC, Revell Troy, Dave ZL2MQ, Stan ZL2ST, Mike ZL2VM and Karl ZL1TJ. Minutes of the previous meeting, confirmed correct: ZL2TC, ZL2MY. Documents from the Napier City Council regarding the ground lease for the club rooms. Last signed in 2009 and due for renewal. Conditions remain the same, annual ground rent of near $400 has crept up over the years. Tabled by Stan: documents related to the change over of electric power supply companies. Finance: Account payable to the Napier City Council for annual lease. The cost of re-programming the Eprom memory of the Tait radio was paid by Laurie. He will not pass the charge on to the club and so made the club a $100 donation. A reminder by Dave ZL2DW of the forthcoming Christmas dinner, bookings to himself or Laurie. 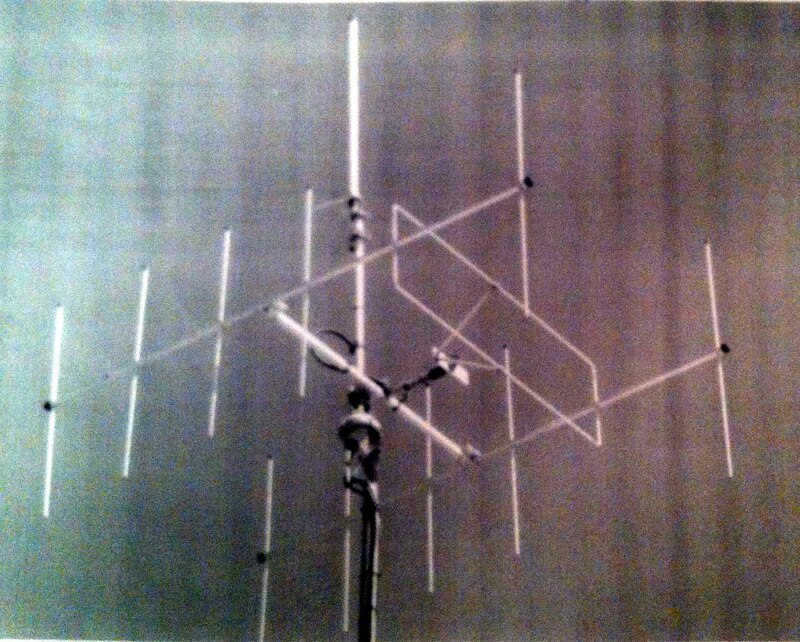 Lee ZL2AL reported that an aerial rotator needed for the club’s new HF antenna system will be donated to the club by himself and Gary ZL2IFB. Originally bought at trademe for $120 for the contest station but now going spare. Lee also reported briefly on the recent CQ WW contest, about 5500 contacts were made, results to be published when available. The meeting was followed by the Annual General Meeting after which the homebrew contest for the PanPac Trophy was held. 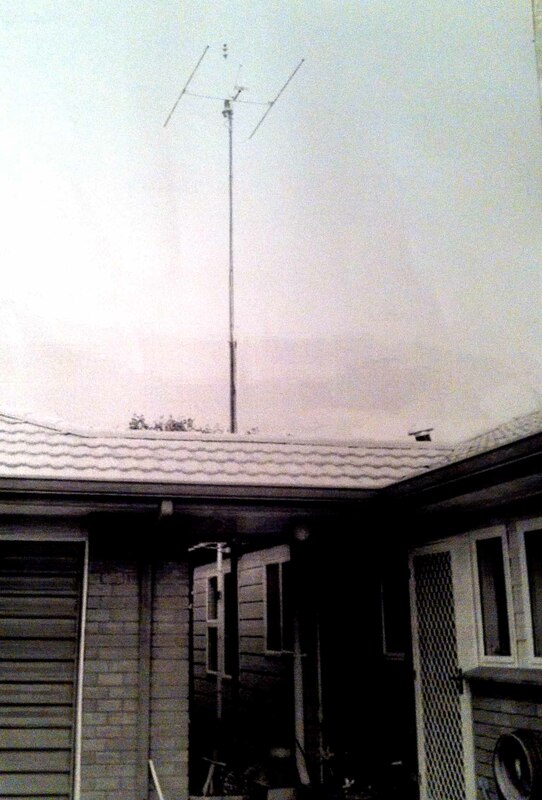 Laurie ZL2TC: Left – A UHF co-linear antenna sometimes called ‘Coco’ antenna, made from 50 Ohm coax cable inserted in a fibreglass rod. Simple but theoretically capable of a 8 Dbi gain. Dave Walker, ZL2DW’s Junk Box Power Supply. Cost = $10.00 and the Winner on the Night! 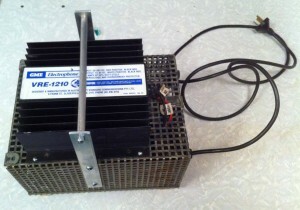 a home brew power supply capable of 12 Amp at 13.8 Volt. All components out of the junk box, the regulator is a truck 24 to 12 volt reducer. 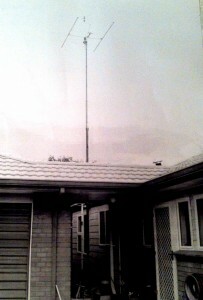 Below – Dave’s recently constructed 9 meter tilt over mast, a 2m skeleton slot aerial constructed from what was a Gisborne’ kitset. Mike ZL2MY: further refinements to the local (Holger’s) version of the Hexagonal beam under construction. The mounting base and central post with internal coaxial links now completed. The winner was: Dave ZL2DW’s power supply with 4 votes. 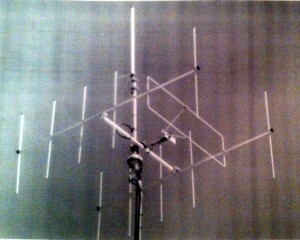 Shared second with 3 votes each went to Dave ZL2MQ’s amplifier and Mike ZL2MY’s hex beam. 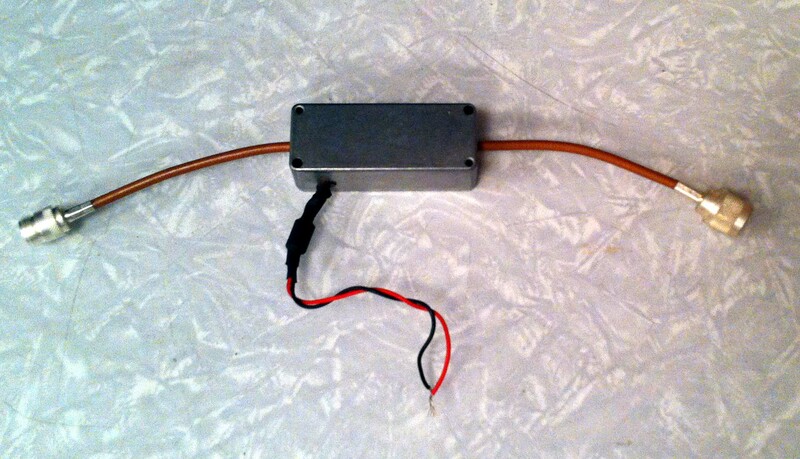 Dave ZL2MQ: Left – A broadband (30 to 3000MHz) receiver pre-amplifier. Based on the PCA103plus chip, has a maximum gain of 27 Db, but reduced to 15 Db by filters and attennuator. Beautifully built. Held at the clubrooms 123 Latham Street on 6 November 2013. Chair: Laurie ZL2TC, the meeting started at 7:45 pm. Minutes of the previous meeting read and confirmed true and correct: ZL2TC, ZL2MY. Briefly: Another successful year for the club, good support for various activities and club meetings. A modest increase in membership and the refurbished and re-equipped radio room being used for contest operation. The building is in need of further maintenance and a proposal to have one member act as building custodian is to be tabled. Moved by ZL2TC and seconded by ZL2ST that the report be accepted. Carried. Treasurer’s report: Stan ZL2ST presented the annual accounts, audited by S.E.Rooney as usual. Copy attached to these minutes. The club’s finances are basically hand to mouth and income and expenditure are roughly balanced only thanks to repeaters not needing maintenance this year and also a lower cost electricity supplier having been found. A transfer of $1000 was made from the AREC account to the NARC account. Moved by ZL2ST and seconded by ZL2AL that subscriptions remain at $25 and that the Treasurers report be accepted. Carried. The Tait TM 8250 radio was found to be inoperative upon checking after being lent out for use during ths Silver Fern Rally. The eprom could not be re-programmed and the radio had to be returned to the manufacturers to have this done at considerable expense. Now that this has been done progress can be made with the proposed portable SAR station. Moved by ZL2VM, seconded by ZL2ST that the report be accepted. Carried. Election Of Officers: President ZL2TC, secretary ZL1TJ and treasurer ZL2ST were re-elected unopposed. Active committte members: Lee ZL2AL and Mike ZL2MY are now joined by Wally ZL2MO. AREC convener: Mike 2VM , Repeater trustees ZL2DW and ZL2TC and auditor Sue Rooney. Custodian, primarily keeping an eye on graffiti and other external damage so repairs can be initiated speedily. The last Channel 1 Television transmitter is due to close down at the end of November and RSM has advised that from 6th December 2013 onwards (just in time for the annual VHF/UHF/SHF Field Day Contest) Amateurs throughout New Zealand will have access to the bottom end of the 6 metre band (50 to 51 MHz) without needing to apply for a permit. Note that the management right under which the channel 1 television transmitters operated does not expire until August 2015 so 50 – 51 MHz can not appear on the Amateur General User Radio Licence until after this date. Instead RSM are putting in place licence No 4122 which will say that “Persons who hold a New Zealand General Amateur Operator’s Certificate of Competency and a callsign issued pursuant to the Radiocommunications Regulations 2001 may operate an amateur radio station under this licence”. The power on the licence will be 30 dBW (1 kW) to bring it into line with the power on the General User Radio Licence for Amateur Operators.